Q: First I want to thank you for giving an address to write to for people like me who have nothing to do with computers to have the chance to try to respond to all life has to offer. 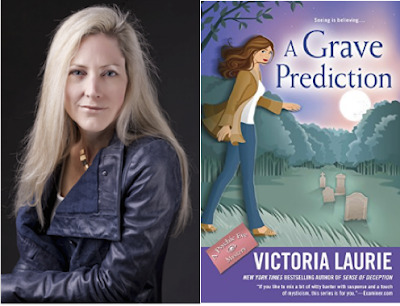 Please consider me for entry in your contest to win an autographed copy of Victoria Laurie’s “A Grave Prediction.” — Danan G., Chino, Calif.
A: You are very welcome, Danan. I like to give everyone a chance to win cool stuff, especially when it’s an autographed copy of a book by one of my favorite authors. I randomly drew four names to win the four copies of the book I have, and you are one of the winners! The other winners are Kimberly Fischer (who won via email entry), Lara Baker (who won via Twitter entry) and Kerri Snow-Hugmeyer (who won via Facebook entry). Come back tomorrow to read my full and compelling interview with Victoria about “A Grave Prediction,” the end of the Ghost Hunter series, and what she’s got in store for fans next. A: Hulu has picked up the dark-comedy series — starring Tommy Dewey and Michaela Watkins — for a third season. In more Hulu news: “The Path” is in production on its second season, while season five of “The Mindy Project” premieres this fall.